Forget the diminutive porcelain tiles that long dominated suburban bathrooms; today, it's all about large format tile, which offers a cleaner, more sophisticated look with minimal grout lines. Whether used for modern kitchen tiles, decorative bathroom tile or outdoor tile, large format currently dominates the industry. Vast, thin and undeniably sophisticated, these tiles can be used in a variety of contexts. Large format tiles are by no means new, but at one time, they were expensive and impractical to install. That has all changed, thanks to recent advancements in manufacturing and installation. As technology continues to improve, tiles grow ever larger. At one time, the official definition for large format tile was anything exceeding 8 by 8 inches, as highlighted in the "Tile Council of North America" handbook. Since then, perceptions have changed greatly, and few would regard 8 by 8 tiles as large. Now, many designers and homeowners opt for huge tiles, as large as 40 by 80 inches. Officially, however, tiles must measure at least 15 by 15 inches in order to be deemed large. In addition to growing larger, tiles have also become thinner. Manufacturers aim for the thinnest possible tiles, while still maintaining their structural integrity and often touted durability. 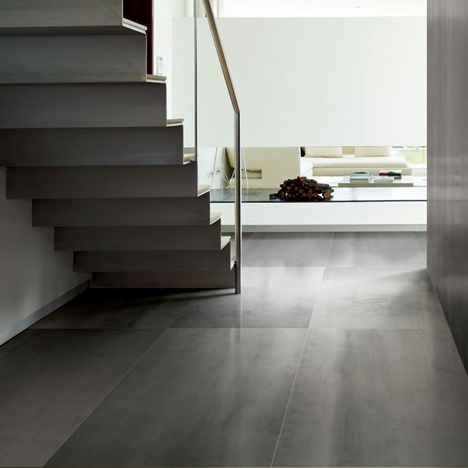 Today, porcelain tile just 3–4 millimeters thick are far from unusual, although 5 millimeters is more typical. Even just a few years ago, large tiles were primarily used in commercial projects. They've since been introduced into many homes in warmer climates, where homeowners prefer cool tile to carpet and other flooring options. Whether they opt for polished concrete tile or glass mosaics, homeowners and designers both favor large format tile for its spacious feel and general sophistication. Large format naturally expands a room's look, thanks to a relative lack of grout lines or other disruptions. This lends every room a more spacious feel, especially when materials and colors are chosen accordingly. Tile size must be taken into account when installing in especially diminutive rooms, however; although impressive, 40 by 80-inch tile may not work in a tiny bathroom. Few flooring styles match the elegance and timelessness of stone tile, but not everybody can afford stone tile or decorative limestone. Those unable to invest in stone flooring can turn to large format porcelain tile to effectively mimic the look of natural materials. Thanks to recent advances in technology, these stone tile substitutes look more accurate than ever imagined possible. Large format means that fewer joints break the effect of mimicked tile or even wood. Large tiles offer a sense of solace to those who prioritize easy installation above all else. Installation is quick, in part, because there are fewer tiles to place, but also because thin materials are easier to drill and cut. The haste with which these tiles can be installed lends them even greater affordability, as a lengthy installation process is naturally more expensive. Many contractors install large tiles directly over existing flooring; this is possible because these thin tiles weigh just over 1 pound per square foot, rather than the 4 pounds per square foot that would have been expected in the past. 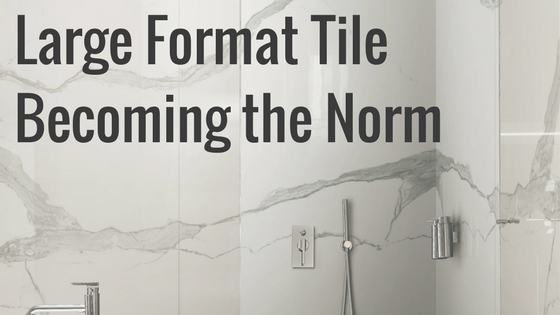 Thanks to recent advancements in technology, large format tile is more durable than ever, especially when constructed from travertine and other notoriously sturdy materials. In response to initial concerns about durability, manufacturers have begun applying thin resin layers to large tiles. These slightly increase the thickness, but also reduce the risk of tiles becoming brittle or prone to breakage. Although durable, today's large tiles are also quite easy to fix in the rare event of damage. Nobody likes cleaning the grout between kitchen floor tiles. This job is particularly unpleasant for those with tiny tiles; the more tiles, the more joints, and the greater need for sanitation. Large format tiles minimize joints and are therefore easier to clean and maintain. Perhaps the greatest benefit of large format is that it looks gorgeous nearly everywhere, and can fit any home's style. Whether used for traditional kitchens or contemporary bathrooms, large format style can easily be adapted to fit preferred aesthetics. In addition to traditional floor installation, large tiles can be installed on walls or in showers to create an especially unique look. These tiles allow designers to realize more intricate visions; for example, in Pierre Charpin's Fragments collaboration, large tiles allow for a more impactful display of minimalist design. Large format has officially taken over, and the trend is not about to disappear anytime soon. If anything, evolving technology will allow tiles to grow even larger and thinner than they are today. 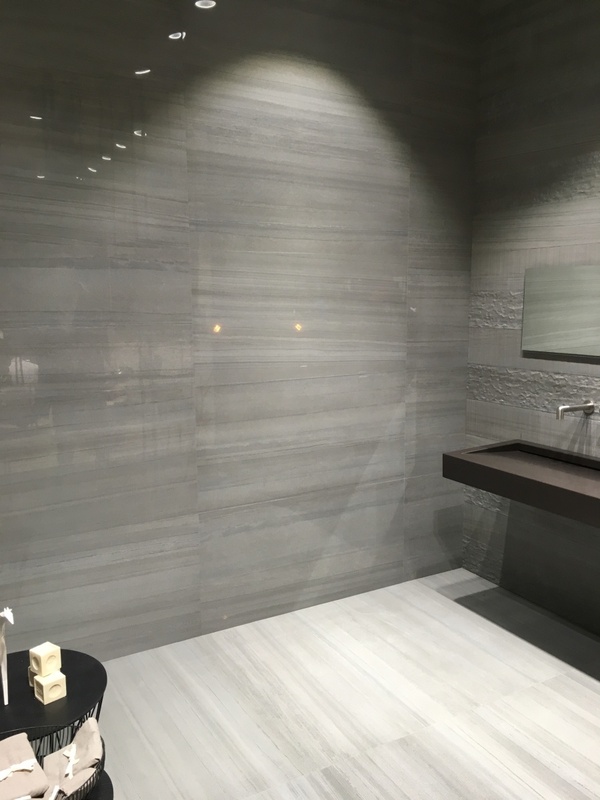 This evolution will allow for more intricate designs and a greater range of artistic options, while also ensuring affordable installation and impressive durability. Choose the right tile every time by avoiding these tile purchasing mistakes. Explore our inspiration gallery and contact us to learn more!